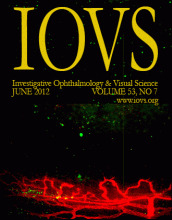 Investigative Ophthalmology & Visual Science (IOVS), published monthly in print and online, is an official journal of the Association for Research in Vision and Ophthalmology (ARVO), an international organization whose purposes are to encourage and assist research, training, publication, and dissemination of knowledge in vision and ophthalmology. Included are original contributions that emphasize clinical and laboratory hypothesis-based research with statistically good results that clearly advance the fields of ophthalmic and vision research. IOVS de-emphasizes purely descriptive research. Subjects cover the 13 sections represented by ARVO's membership. Short updates on notable new developments in important research areas are also published, but only by invitation. Summaries of meetings/symposia and general review articles are not considered.